Everyone should have a tuner on their board or in their signal chain and if you are looking for a cool pedal tuner, look no further. Gone are the days when you had to stop playing, unplug from your amp and then plug in a tuner, or even hold one against your guitar. Today there is a great choice of pedal tuners available that allow you to press a button on the floor (with true bypass so no one can hear you tuning up) and tune quickly and accurately. You won’t go wrong with either of these tuners. With a trend to smaller/tiny pedals both of them prove easy to use (one touch) and have bright displays; having tested them against other tuners they are also very accurate. So do you go for the Polytune at around £55 or the Mooer at around £45? Both are so small that you can’t get a battery in them so a mains adaptor is essential; they should however squeeze onto your pedal board with ease. The Polytune Mini from TC Electronics is a smaller version of the Polytune which was released to great acclaim some years ago. As well as being one of the most precise tuners on the market it is also the smallest polyphonic tuner. This means that you can check the tuning of all strings simultaneously, and then tune those that are out using the chromatic mode. You just strum all six open strings to instantly view which strings are out of tune – the six LED columns light up – green for in tune red above is sharp, red below is flat – then pluck the individual strings which show as being out to automatically switch to Chromatic mode. There is a little switch on the side which can move you into Dropped, Capo and Drop D tuning mode. 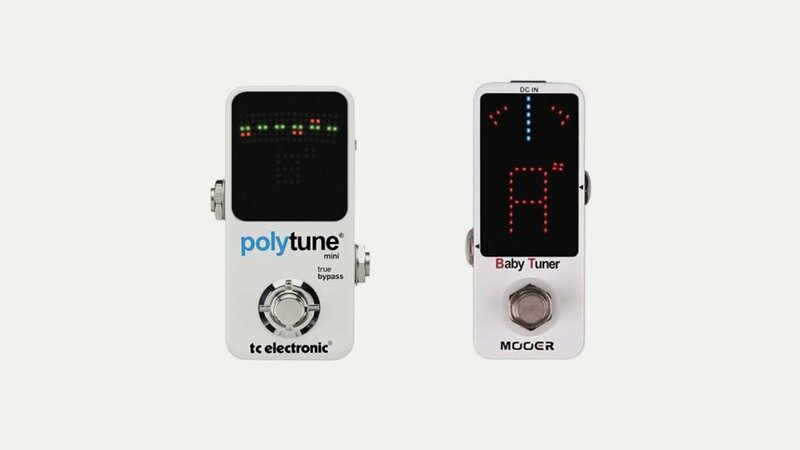 These include five dropped tunings (Ef to B, in semitones) and seven capo tunings (F to B, in semitones), as well as drop D.
The Mooer Baby tuner is a little smaller – the same height and depth but a little slimmer – and only has a chromatic mode. This means you strum each string individually and a bright LED ‘needle’ shows blue in the middle for in tune and red to the left for flat and sharp to the right. The display is very bright and clear which you can see easily when you are standing up. We tried both with a variety of guitars – a Gibson Midtown Custom Semi, a Godin 5th Avenue Hollowbody, a Viktorian Custom Carbon Fibre electric and a Tanglewood electro-acoustic. All were tuned first using a hand held tuner and a floor tuner in a multi-effects unit to ensure they were correctly in tune. The Polytune seemed a little off at first until we realised that out of the box it was not in ‘Standard’ tuning! Once we got it into this (beware – there was no manual in the box so it was by intuition we worked out how to change the settings) it was very fast. Strumming all six strings showed a row of green LEDS. Moving a couple of strings flat and sharp slightly showed up immediately. Using the chromatic mode was quite fiddly though as it seemed very sensitive, particularly with the Gibson. The Mooer was very easy and simple to use – plug in, press the footswitch and pluck a string. The display was large and brighter than the Polytune. Again the tuner picked up slight variations immediately – the needle showing red either side of the centre to indicate sharp or flat. It was not as sensitive as the Polytune and checking showed it was accurate. We also tested them against each other and both agreed indicating tuning accuracy. Both are great little pedal tuners, the Polytune being a very fast way to check tuning although more sensitive to getting in tune. In a band /stage situation where you might not hear if you have gone out of tune the Polytune would be great – strum to check and then tune the strings it says are off. The different tuning modes would also be very useful. The Mooer is easy to use and straightforward, with no whistles or bells. The only downside with both is the need for an external power supply. Take your pick – both are to be recommended.